The recent demise of alluring actress turned powerful politico Jayalalithaa Jayaram has caused a void in the politics of India’s Tamil Nadu state. The 68-year-leader of the All-India Anna Dravida Munnetra Kazhagham (AIADMK) served as Chief Minister of Tamil Nadu from 1991-96, 2001-06 and from 2011 to date. Jayalalithaa hailed as “Amma” (meaning mother/madam) was virtually the uncrowned queen of Tamil Nadu during her years of rule as Chief Minister. There was however an earlier phase in her life when the beautiful Brahmin woman reigned as the uncrowned queen of Tamil cinema for over a decade from the mid-sixties to mid-seventies of the 20th century. ‘Spotlight’ being a column focused on cinema related matters – returns after several weeks and – re-visits the fabulous film career of actress Jayalalithaa. 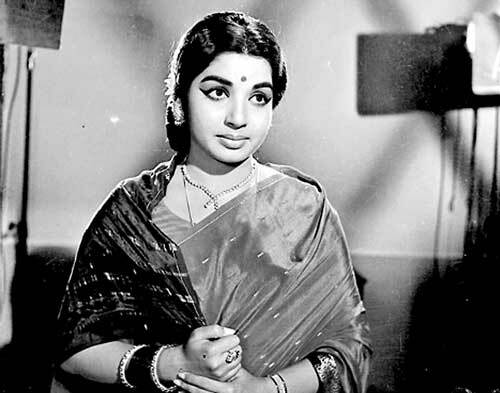 Jayalalithaa dazzled on the silver screen during the years she was an actress. According to filmographic estimates, she acted in 142 films from 1964 to 1980 in the Tamil, Telugu, Kannada, Malayalam, Hindi and English languages. Of these 77 films ran for over 100 days and 18 for more than 25 weeks. Though she debuted in Kannada and Telugu language films in 1964 before doing so in Tamil, Jayalalithaa went on to act in about 90 Tamil movies. Telugu came next with nearly 35-40 films. Kannada was third with 10 movies. She acted in two Hindi films as a child artiste in one and leading lady in another. She has also acted in one Malayalam and one English film. 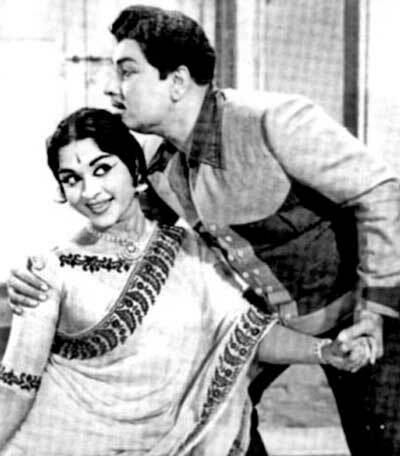 Jayalalithaa’s first film in Tamil was ‘Vennira Aadai’ screened in 1965. The last Tamil feature film where she acted as heroine was ‘Nadhiyai Thedi Vandha Kadal’ released in 1980. In 1992 when she was Chief Minister of Tamil Nadu Jayalalithaa acted in the Tamil film ‘Neenga Nallaa Irukkanum,’ where she played herself on screen in a cameo appearance. She has acted opposite the famous film star-politico M.G. Ramachandran (MGR) in 27 films. MGR was her lead actor in films, paramour in personal life and mentor in politics. Among her successful films in Tamil were ‘Adimai Penn,’ ‘Naan,’ ‘Maatukkaara Velan,’ ‘Aathiparasakthi,’ ‘Pattikaadaa Pattanamaa,’ ‘Kavalkaran,’ ‘Engiruntho Vanthaal,’ ‘Kumari Penn,’ “Muthuchippi’,‘Kandhan Karunai,’ ‘Nam Naadu,’ ‘Chandrothayam,’ ‘Kudiyiruntha Koavil,’ ‘Engal Thangam,’ ‘Enga Maamaa,’ ‘Suryakanthi,’ ‘Avan Thaan Manithan,’ etc. Apart from MGR, Jayalalithaa acted opposite stars such as Sivaji Ganesan, Gemini Ganesan, Jaishankar, Ravichandran, Muthuraman, A.V.M. Rajan, N.T. Rama Rao, A. Nageswara Rao, Krishna, Sobhan Babu, Rajkumar and Kalyankumar. Her splendid acting was once praised to the skies by none other than her arch enemy in politics Muttuvel Karunanidhi, the DMK leader. This was 42 years ago. ‘Thirumangalyam’ released in January 1974 was Jayalalithaa’s 100th film. There was a felicitation ceremony where the Chief Minister at the time, Karunanidhi, was the Guest of Honour. Recalling that his late leader C.N. Annadurai had once described actress Bhanumathy as “Nadippukku Ilakkanam Vahuthavar” (devised the grammar of acting), Karunanidhi praised Jayalalithaa in similar vein as “Nadippukku ilakkiam vahuthavar,” which means “devised literature in acting”. Apart from acting Jayalalithaa was an accomplished dancer too. She lit up the screen and stage by her performances. She was dubbed “Aadal Arasi” or Dancing queen. She excelled in cabaret as well as classical dancing. Her dance drama, ‘Kaviri Thantha Kalaichelvi,’ was a smashing success. Jayalalithaa was multi-talented. She was described as “Kalaichelvi” (Maiden of the Arts) by many. She has been a magazine columnist, short story writer, novelist and film producer before venturing out as MG Ramachandran’s protégé into the sphere of politics where she rose to the top after MGR passed away. Though she sizzled on the silver screen enacting many glamorous roles, Jayalalithaa was a versatile actress who made an impression if given challenging roles with scope to display histrionic ability. She exuded chic and élan in her film career and was a favourite among teens of that era. She designed many of her costumes and was a trendsetter in fashion for young women. Jayalalithaa was one of the first Tamil film heroines to don bathing costumes on screen and was described as a bombshell in bikini. People looking at her physical corpulence – which could be a sign of her ill-gotten opulence – may not believe that the rotund lady they saw was at one time slim and lissom. Indeed she was and a ravishing beauty too! Jayalalithaa walked into the hearts of many by adopting an attractive, unique and stylish way of walking hitherto unseen on the Tamil screen. She was the dream girl of many a teenager and the favourite pin-up star of myriad fans in those days. Jayalalithaa was born on 24 February 1948 at Melukote in the Pandavapura division of Mandya district of present day Karnataka state. Jayalalithaa was given her grandmother’s name Koamalavalli at the time of birth. The name Jayalalithaa was adopted later when she was enrolled in the kindergarten class at Bangalore (now Bengaluru) Bishop Cotton School. It was derived from the names of two houses where she resided in Mysore. One was “Jaya Vilas” and the other “Lalitha Vilas”. The name Jayalalithaa was originally spelled with one ‘a’ at the end. Later in 2001 another ‘a’ was added for numerological reasons. Jayalalitha became Jayalalithaa. However, she was widely known by her pet name “Ammu”. In recent years after becoming Chief Minister, she was referred to as “Amma,” meaning mother or Madam. Jayalalithaa is of Tamil Vaishnavite Brahmin Aiyengaar stock hailing from Srirangam in the Trichy district of Tamil Nadu state. Both her paternal and maternal grandparents relocated to the state of Karnataka which was formerly known as Mysore. Jayalalithaa’s maternal grandfather, Rengasamy Aiyengar, had moved from Srirangam to Nellore in Andhra Pradesh and thereafter to Karnataka where he worked at Hindustan Aeronautics. Rengasamy had three daughters and a son. His second daughter was named Vedavalli, who later turned to acting in films and adopted the screen name Sandhya. She was Jayalalithaa’s mother. Jayalalithaa’s paternal grandfather was Dr. Narasimhan Rangachary. He too moved to Mysore and served as the court physician to Krishnaraja Wodeyar IV, who reigned as the Maharajah of Mysore from 1894 to 1940. Rangachary had a son, Jayaram. Vedavalli was given in marriage to Jayaram as his second wife with the concurrence of both families. Jayaram’s first wife was Jayamma, a Kannada woman from Narasipur in Mysore. Vedavalli had two children by Jayaram. One was a son, Jayakumar, and the other a daughter, Jayalalithaa. The children were born in the lap of luxury as their paternal grandfather Dr. Rangachary had amassed much wealth as the Mysore Maharajah’s personal physician. Fate however decreed that his daughter-in-law Sandhya and granddaughter Jayalalithaa become actresses due to financial difficulties. Jayalalithaa’s grandfather Rangachary died before she was born. Thereafter things took a turn for the worse. Jayalalithaa’s father Jayaram though a BA graduate had never worked in his life. Worse still, he was a recklessly extravagant spendthrift and wastrel. Within a very short period, he squandered away the family fortunes on alcohol, women and gambling. Jayaram died before his daughter reached the age of three. Whatever that remained of the family wealth went to Jayaram’s first wife. The widowed Vedavalli was left destitute and returned to her father’s home in Bangalore. She learnt shorthand and typewriting to take up a clerical position to help support the family. Her younger sister Ambujavalli had moved to Chennai (then Madras) and was working as an air hostess. She also started acting in dramas and films using the nom de plume Vidyaavathy. After a while Jayalalithaa’s mother also relocated to Madras and stayed with her sister. She worked in a commercial firm and began dabbling in acting.Soon Vedavalli became a full time actress using the name Sandhya. Sandhya as an actress never became a star but was able to garner many roles. Most of her roles however were in a supportive capacity. Meanwhile Jayalalithaa lived with her maternal grandfather and unmarried aunt Padmavalli in Bangalore. “Padma chithi,” as she called her aunt, was like a foster mother to her. Jayalalithaa studied at Bangalore’s famous Bishop Cotton Girls school in her early life. She would go to Madras to be with her mother during school holidays. In 1958 Padmavalli got married and left her father’s home. Sandhya then got down her children to Madras to be with her. Jayalalithaa was admitted to the prestigious Sacred Heart Matriculation School popularly known as Church Park Presentation convent or Church Park. She was 10 years old then. Once Sandhya took her daughter to the studio with her. The film ‘Shree Shaila Mahathmiya’ was being shot. While Jayalalithaa was watching the shooting, a problem arose. The child actor playing the Goddess Parvathy in a school drama scene in the film had not turned up. The producer turned to Sandhya. Jayalalithaa was swiftly dressed up as Parvathy and the scene was shot. This was her first screen performance. Jayalalithaa was a brilliant student at Church Park and placed first in her class most of the time. She particularly excelled in English. Jayalalithaa’s maternal great grandfather had been a lawyer practising in Karur. It was Sandhya’s hope that her daughter too would become a successful lawyer like her grandfather. The daughter too subscribed to that ambition. Sandhya however made sure that apart from studies, Jayalalithaa also learnt music, dancing and singing. She learnt Western classical music and how to play the piano at Church Park. Jayalalithaa also learnt carnatic music at home from the vocal guru Gopalakrishna Sarma. The danseuse K.J. Sarasa taught her Bharatha Natyam. She also learnt Kathak and Mohini Aattam. Jayalalithaa’s Bharatha Natya ‘Arangaetram’ or debut performance was in May 1960. It was held at the Rasika Ranjani Sabha hall in Mylapore. She was 12 years old at the time. The Chief Guest was the great Tamil thespian Sivaji Ganesan. Sivaji in his address commended Jayalalithaa’s dancing. He also praised her physical beauty particularly her figure and fair complexion by describing Jayalalithaa as a “thangachilai” or golden statue. Sivaji Ganesan also called upon Jayalalithaa to act in films when older. He was definite that she would take to acting. Sivaji predicted then that “Ammu” would become a great film star. Sivaji’s comment did not go down well with Sandhya and Jayalalithaa. Both mother and daughter shared the vision of Jayalalithaa becoming a lawyer. Yet within five years Sivaji Ganesan’s prophecy came true. Furthermore Jayalalithaa was to play leading lady to Sivaji himself before the decade was over. Her mother Sandhya and aunt Vidyavathy acted in dramas produced by the famous Y.G. Parthasarathy the father of comedian Y.G. Mahendran. YGP as he was known ran the drama troupe United Amateur Artistes (UAA), which staged English and Tamil plays. Soon Jayalalithaa while a school girl began acting in some YGP plays along with her mother and aunt. She acted in plays such as ‘Malathi,’ ‘The Whole Truth,’ ‘Tea House of the August Moon’ and ‘Under Secretary’. Former Indian President V.V. Giri’s son Shankar Giri saw some of these plays and was impressed by Jayalalithaa. Shankar Giri approached the mother Sandhya and told her that he wanted to cast her daughter in an English docudrama called ‘The Epistle’. Sandhya reluctantly agreed with the condition that shooting should be held only during weekends or school holidays. The film however dragged on and was finally released years later when Jayalalithaa was a star. It was a flop. Meanwhile, Jayalalithaa continued with her studies and passed her SSLC/Matriculation exams with flying colours. Her marks were the second highest in the state. Entitled to a merit scholarship, Jayalalithaa obtained admission to Stella Maris College in Madras to follow PUC classes when the academic term began. A brilliant career based on education seemed to be beckoning at that juncture. Destiny decreed otherwise. Sandhya had acted in a Tamil film ‘Karnan’ produced and directed by Kannada filmmaker B.R. Panthulu. The film ran for over a 100 days and a celebration was arranged at the Woodlands Hotel. Jayalalithaa dressed in a silk saree accompanied her mother to the event. She was a “sweet 16” then and a scintillating sight to behold. B.R. Panthulu saw her and immediately decided to cast her opposite Kalyankumar in the Kannada movie ‘Chinnada Gombe’ that he was making. Sandhya demurred saying her would be studying for her PUC (Pre-university certificate) in two months’ time. Panthulu promised to finish all shooting within two months. Sandya agreed and Jayalalithaa started acting. She was paid Rs. 3,000. Panthulu kept his promise and completed shooting in six weeks. Jayalalithaa forgot all about films and got ready to attend classes at Stella Maris College. It was at this point of time that one of the greatest Tamil film directors, C.V. Sridhar saw the rushes of ‘Chinnada Gombe’. Sridhar was planning to shoot a colour film with newcomers under his famous banner Chitralaya films. He felt Jayalalithaa was ideal to act in the role of a schizophrenic widow in his film ‘Vennira Aadai’ (White Dress). Sridhar had earlier tried out Hema Malini for the role but was dissatisfied. (Hema later switched to Hindi and became a popular star.) Upon learning that Sandhya and Jayalalithaa were at the YMCA swimming pool for their weekly swim, Sridhar moved swiftly and went to the YMCA to meet mother and daughter. Sandhya was thrilled that the maestro Sridhar wanted her daughter to act in his film. Jayalalithaa however refused to act in more films. She wanted to study. There was a heated argument at home. Finally Sandhya revealed that the family was in dire straits financially. Acting opportunities were becoming scarce for her and debts were piling up due to their extravagant lifestyle. Being launched by Sridhar meant glowing prospects and a bright future in an acting career. The daughter was asked to make the correct choice. After a long night of deep thought Jayalalithaa conveyed her decision in the morning. It was farewell to studies. She went to Stella Maris for a day and bade adieu! Jayalalithaa’s first Tamil film ‘Vennira Aadai’ made history even before it was released by getting an ‘A’ certificate as an adults only film. The last time a Tamil film got an A certificate was in 1951 for ‘Marma Yogi’ due to scenes of a ghost. Apparently the Film Certification Board was upset by some shots of Jayalalithaa bathing and dancing in the film. The movie when released ran successfully for over a hundred days in several theatres. Jayalalithaa got rave reviews. Thousands became her fans overnight. A star was born! A fragrant sign of this stardom was in posing for advertisements extolling the virtues of Lux soap. She began to get a lot of film offers. The biggest and life-changing break came in the form of B.R. Panthulu again. The man who made ‘Chinnada Gombe’ Kannada film with Jayalalithaa now wanted to make a colour film in Tamil with the legendary M.G. Ramachandran (MGR).This was the first MGR film by Panthulu. MGR wanted a new face as his leading lady. Panthulu suggested Jayalalithaa. So MGR and wife Janaki watched the Kannada and Tamil film starring Jayalalithaa. It was MGR’s wife Janaki who insisted that MGR act with Jayalalithaa. The film was Jayalalithaa’s second Tamil film. It was based on the Rafael Sabatini character Captain Blood. The film named ‘Aayirathil Oruvanor’ or ‘one in a thousand’ was a block buster. MGR was 48 years old and Jayalalithaa only 17. Despite the 31-year age difference the pair hit it off grandly on screen. More films followed and the duo made 27 films together in nine years. Almost every film was a commercial success. The jewel in the crown was ‘Adimai Penn’ or slave girl with Jayalalithaa in a dual role. The film released in 1969 was produced by MGR himself. It was in this film that Jayalalithaa sang in her own voice for the first time on screen. Usually actors merely lip synch for the screen while the numbers are actually sung by playback singers. The singers P. Susheela, S. Janaki and L.R. Eeaswari used to voice for Jayalalithaa. It so happened that MGR once heard Jayalalithaa singing softly by herself on the sets of another movie ‘Kannan En Kaadhalan’ and felt she sang well. So a solo was given to her in ‘Adimai Penn’. The song ‘Amma Endraal Anbu’ was written by lyricist Vaali and music composed by K.V. Mahadevan. She had a creamy, croony voice and the song got popular. She sang in her own voice in some other films too. Jayalalithaa’s first screen song began with the word ‘Amma’. Years later millions of supporters began calling her “Amma”! The immensely popular MGR had a fan club network known as Rasikar Mandram. Members of these fan clubs warmed to Jayalalithaa being the leading lady of their leader. Though several actresses such as Bhanumathy, Padmini, Saroja Devi, Manchula, K.R. Vijaya, Latha, etc. had acted paired with MGR, it was Jayalalithaa who captured the hearts of his fans. Years ago in a movie called Thanipiravi MGR played Lord Muruga and Jayalalithaa his consort Valli, in a dream sequence. A picture of both together as Murugan and Valli was framed and worshipped by many fans. Some people lit camphor and laid flowers before it. MGR’s wife Janaki was called “Anni,” meaning wife of the elder brother by fans, who also referred to Jayalalithaa as “Sinna (small) Anni”. MGR himself was infatuated with her. Though they never formally married, Jayalalithaa was regarded as the love of MGR’s life. In spite of her unofficial liaison with MGR, the actor to whom Jayalalithaa was linked romantically was Telugu actor Sobhan Babu. He was however married and refused to divorce his wife and marry Jayalalithaa. Once when a Tamil magazine had a gossip article about this relationship, Jayalalithaa wrote an open letter to the publication in which she stated that both of them were in love and would marry if and when Sobhan Babu divorced his wife. That never happened and Jayalalithaa remained single. She was at times referred to as “Selvi” or maiden/unmarried woman. Jayalalithaa was the uncrowned queen of Tamil cinema from 1966 to 1975 as the most popular highest paid actress. Then came a time when MGR and Jayalalithaa got estranged due to reasons that are unclear. While Jayalalithaa faded away from the screen, MGR himself formed his own political party the All-India Anna Dravida Munnetra Kazhagham (AIADMK) in 1972 and became Chief Minister of Tamil Nadu in 10977. After a few years of separation there was rapprochement between MGR and Ammu. MGR enticed Jayalalithaa into his party in 1982 and launched her on a successful political career by making her Propaganda Secretary and Rajya Sabha (Upper House) MP. With MGR’s blessings Jayalalithaa blossomed into a formidable politician. After MGR’s death in 1987, she wrested full control of the party in 1989 and led the AIADMK to victory two years later.MGR had been called “Puratchi Thalaiver” or Revolutionary Leader. Jayalalithaa became known by the feminine equivalent of revolutionary leader – “Puratchi Thalaivi”. Jayalalithaa at 43 was the youngest-ever Chief Minister to assume office in 1991. From that time till her demise Jayalalithaa, who sparkled on the silver screen as uncrowned queen, shone for 25 years as the brightest star in the Tamil Nadu political firmament.